During my younger days in the mid 90’s during my senior year in High School up until just after the events of September 11th, I myself self-identified as a full fledged “big L” libertarian. I voted for Libertarian party candidate Harry Browne in the 2000 election as I felt that both Al Gore & George Bush just plain sucked. Post 9/11 I got swept up in emotions, wanting “revenge” for the attacks and disassociated myself from identifying as a “big L” libertarian when the Libertarian party came out against the war in Afghanistan. 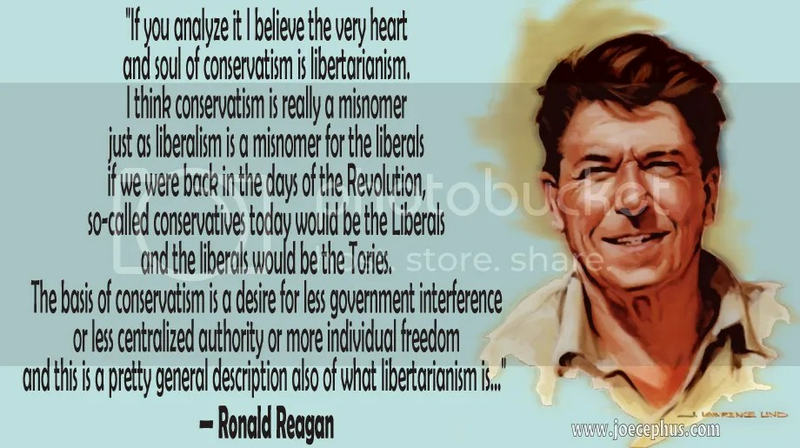 But truth be told I don’t think being a “conservative” is really all that much different with being a libertarian. As a matter of fact I believe that the two are nothing more then different leaves on the same branch of the tree of liberty. Ronald Reagan in fact felt very much the same way. The problem lies in that 1. “conservative” and “republican” do not mean the same thing. 2. Modern conservatism has been hijacked by social statists in the religious right and 3. the liberal left through their use of pop-culture have pretty much won the war in bastardizing conservatism in the minds of the American people. So I find the emergence of the term “libertarian” as a much needed breathe of fresh air into our current political discourse. Wanting to maximize freedom is never a bad thing. Individual Responsibility, Where Have You Gone?